Al Mamlaka TV, a 24/7 HD news channel and Jordan’s first state-funded public service broadcaster, went on air in July 2018. Although funded by the government, Al-Mamlaka (‘The Kingdom’) offers public broadcasting services and is therefore neither state-owned nor commercial. It runs as an independent voice and delivers news and broadcast shows on both linear and OTT platforms. Jordan’s new broadcaster resides in a completely new six-storey facility in King Hussein Business Park, Amman, which provides around 8,000sqm of space. This was a greenfield project without any legacy infrastructure or media equipment. Work started in August 2017 and commissioning was done in January 2018. April 2018 saw the successful completion of the project and official handover. The Al Mamlaka project features a sophisticated VSM (Virtual Studio Manager) solution by German innovator Lawo, for facility-wide, overall broadcast system control in support of sophisticated workflows. The systems integrator Qvest Media was responsible for the entire design, build and integration of the infrastructure for efficient station operations. In addition, Qvest Media designed and integrated a customised motorised and curved video wall system that gives the news productions a distinct look and feel. Al Mamlaka TV’s broadcast facility provides complete redundancy, including AV and broadcast IT equipment, and is based on virtualised systems. From the start, the new building was designed to be centrally managed, and the entire infrastructure to be easily expandable to meet future requirements. The other mandate was that the produced media content needed to be made available as a live stream, and the production workflow had to be designed to support 24/7 operation on all channels. 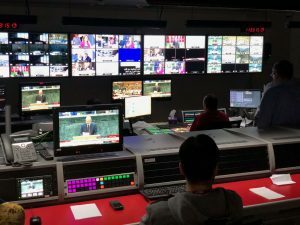 For news production, Al Mamlaka TV uses an all-digital production chain, from the ingest of various live sources and newsfeeds, over news content production, to playout and distribution. The main workflows comprise the planning of news shows and productions, the ingest of live sources and recorded contributions, the news production and approval process, and an automatic transfer of approved material to transmission and deep archiving. “The major task and benefit of using the VSM system is that it creates a familiar workflow for all operators in all news studios and the MCR. VSM is the only control system on the market able to work in a fully IP-based environment and with third-party equipment”, said Ahmad Al Kayal, head of sales at Qvest Media in Dubai. “The implementation of VSM across Al Malaka channel proves its ability to provide the overall control system, regardless of the hardware used and the overall system design. Thanks to a virtual IP switching layer, the VSM system allows to set up a workflow in future news studios that is familiar to users by virtue of their established workflows” Al Kayal added.